If you're interested in some of the high level Very Rare (purple) Outfits and Weapons such as the "Shadow Blast Sling" and the "Carja Blazon Heavy" then you will no doubt have seen the need to have a Lancehorn Heart or Charger Heat item to be able to purchase them from a merchant. In this guide I'll show you where to find these two machines and make the process of farming their hearts a little easier. 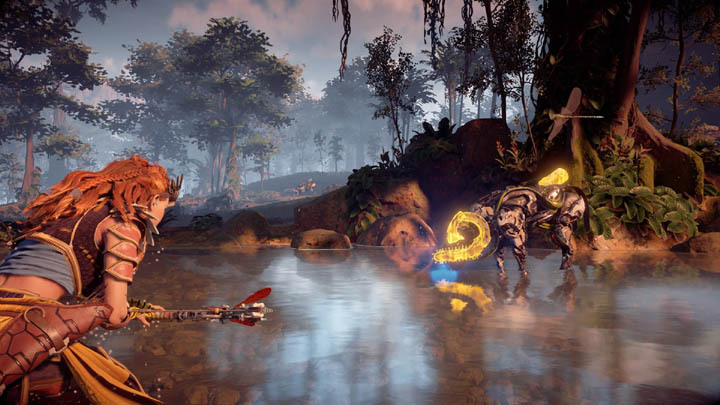 During my time with HZD, I found it a little hard to work out where the Lancehorn and Charger machine sites actually were. I hadn't come across them by the time I had to go to Meridian. To help you with a similar problem, I have included two maps below, one for the Lancehorn and the other for the Charger. 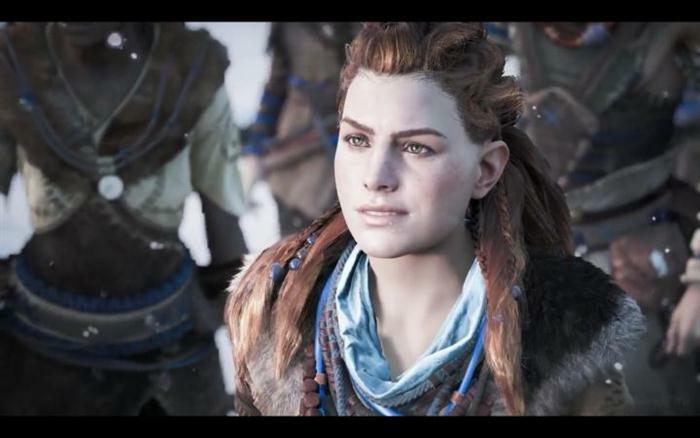 The next thing to consider is the RNG nature of "Hearts" in Horizon Zero Dawn. Basically, any Rare resource (such as a heart) has a low drop rate in the game, meaning that you'll have to kill several of the same machine type before the elusive heart item appears. You'll know you're in luck when the little Blue icon appears above the dead carcass of the machine you just took down. Which purple items need a Lancehorn and Charger heart? 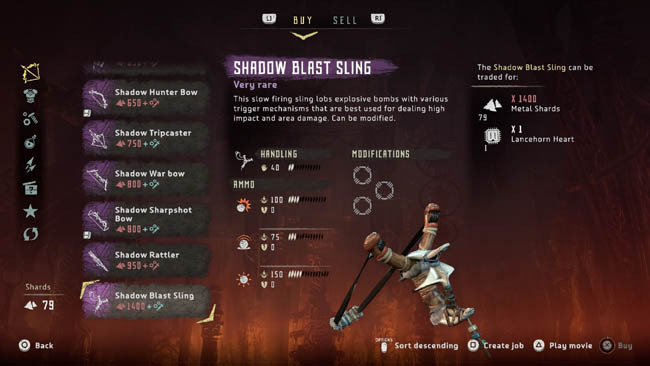 The Shadow Blast Sling is the highest tiered version of the portable bomb caster, allowing Aloy to fling three types of explosive bombs: explosive, proximity and sticky bombs. It's a portable rocket launcher that deals massive damage to groups of machines. This weapon can be bought from a merchant but you will need the Lancehorn heart and a whopping 1400 Shards! 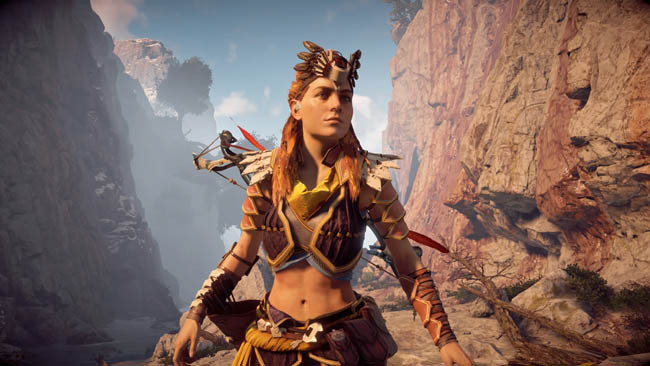 This excellent Very Rare Outfit is one of the few Outfits designed to show off Aloy's athletic side. It requires a moderate sum of Shards (780) and a Charger heart. The Lancehorn looks like an ostrich bird thing, it's very fast and will easily trample you when it charges. They appear in packs of between 4-5, shown in the map location above. This is in the north eastern region of the map, about 4-5 hours into the game. Once you find the Lancehorn site, aim for the weak spots which are the lower back and the horns. Keep your distance and use the Sharpshooter (long range) bow. To farm this machine site, simply head south back towards the Camp Fire, turn around after venturing a distance of about 500 away from the machine site. Turn around and head back to find a new set of freshly spawned Lancehorn, ready to harvest again. The Charge is another creature that doesn't appear on the map that often, in fact I didn't find a single machine site for the Charger on the eastern side of the world map. Study the map image above and you'll notice that a good Charger side is on the western side of the world map, fairly central, to the east of Meridian. There is another convenient Camp Fire to the east of the site and this is where you start your approach. Head along the path, heading west to a small lake. The Chargers are always grazing in the lake making it easy to sneak up and take them down. Unlike the Lancehorn, Chargers are fairly dumb but alot stronger. I prefered to use explosive traps and long range precision arrows to take them down. To repeat the farming process, head back along the path towards the Camp Fire, pass it by and head east a little further. Again try and reach a distance of about 500 away from the machine site to give the Chargers a chance to respawn. There is absolutely no need to save the game. Repeat the process as many times as needed until you collect a Charger heart.